There are several boards inside, a 1 GB DDR2 SoDimm, a 4 GB mini PCIe SSD, an 8 GB mini PCIe SSD (16 GB on the linux version), a mini PCIe WiFi card, and a Bluetooh module. 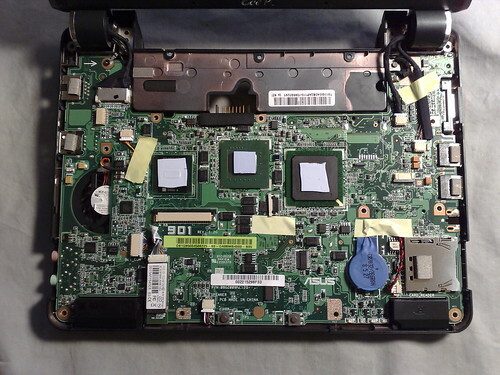 Like the Acer Aspire One, there’s also a 40-pin ZIF connector (unused here) compatible with most 1.8″ PATA hard drives, and there’s a missing mini PCIe connector and SIM holder on the motherboard for 3G. I went ahead and temporarily connected 1.8″ PATA hard drive to the ZIF connector. The thin (5 mm) hard drive fits in a dedicated opening in the bottom casing of the Eee, but requires the removal of the 8 GB mini PCIe SSD. This worked fine, but the 4 GB mini PCIe SSD became the IDE slave device. I hope this info is useful to some people out there! One question that has been bugging me since I got my 701 earlier this year, has anyone been able to successfully upgrade the screen to 8.9″? Is it possible? If I could do this I would go for it as it is the only thing that annoys me about my cool little beast. So, even though the SSD became a slave drive to the 1.8″ PATA – do you think it’s possible to still install XP on the SSD? and keep two drives in the system? Would there be room to keep those two drives? Forget ever buying an EEE PC with the extra ZIF adapter. I have just bought 2 of their PCs (a 1000 and a 901). I was assured that there would be a ZIF adapter and neither had one. In fact, each had the housing for the HD and the mother board had the wiring for the adapter ready to go — but no ZIF adapter was installed. i called ASUS and their pre-sales and tech. support departments both told me that they are aware of this issue but here are no plans to resume to installing the ZIF adapter — and no explanation as to why they stopped. Basically they told me that if you didn’t get one before you probably never will now. It’s to bad but they confirmed it with me. Anyone want to buy a never used EEE PC 901?